Design and planting of the green space began even before the construction of the parish social hall at Mary Help of Christians. This aerial photograph shows the bend in the entrance road that was instrumental in saving a small hammock with cypress trees dating over 175 years in age. At this time the parish was 10 acres in size and the north border was just past the entrance road. The vacant area north of the social hall was the planned site for the elementary school. Note the parking lots which are green space comprised of Bahia grass set upon a thin veneer of dirt atop a crushed rock base. The parking lots are actually constructed to asphalt parking standard but covered with grass and not asphalt. A small lagoon at the point of the parish hall serves as a water habitat for wading birds, fish and otter. Subsequent to the picture date a large Florida maple grove was placed south of the tip of the building softening the edges and giving shade and shelter for the parishioners. The above picture, (June 1996) shows the early features of the Garden. The mulch was secured from 200 Australian pines that were cut down in pre-planning from along the south border of the property. These trees were along the Sawgrass off-ramp but on a precariously narrow strip of land that had a fence on the south side and the waterway on the north side. The Land Stewardship Committee felt that the trees were first exotic and needed to go, second the parish needed the mulch, and third the parish did not want to remove the trees from the canal if they fell in during hurricanes. Years later hurricanes Kevin, Ivan, and Wilma proved the wisdom of that decision. While all the neighboring property owners labored with trees in the canals Mary Help of Christian was free of the burden. Note the packed rock for the parking islands. Instead of asphalt, a one inch layer of dirt was placed atop the stone and sod added. Bahia was the choice for grass as it was durable, needs little water and is slow growing during the cool months. The small hammock (left center) present on the property at the time of purchase was over-run with Brazilian pepper and Ceaser weed. The parish spent many days of hard labor clearing the area and the result was a wonderful shaded area for meditation, reflection and prayer. Truly a HAMMOCK--A green resting place. Additional trees were added to this area as the construction continued on the building. The goal was to have the trees so well established that on opening day of the church there would be no straps holding trees up. By careful planning and making concessions to the landscape workers part of the construction contract, that goal was achieved. 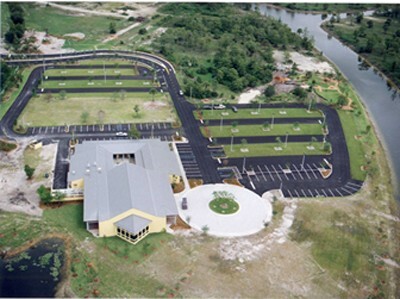 Toro Construction, highly experienced with church work in the South Florida area, was a willing and enthusiastic participant in the land stewardship concept. This picture was taken just weeks before the dedication ceremony. It helps the people of Mary Help of Christians remember where we came from, who we are, and where we are going.